As the largest of Florida’s Ten Thousand Islands and surrounded by pristine maritime habitats and beaches, Marco Island is known for being a scenic and luxurious vacation getaway. The island offers two main public beaches which are very popular as well as a few other beach access points. If you’re looking to enjoy uncrowded beaches in Southern Florida with your family or friends along with the opportunity to view diverse and extraordinary wildlife, Marco Island beaches are ideal for you. Tigertail Beach located on Hernando Drive is a vast, sprawling, and picturesque beach on Marco Island with excellent amenities. It is the most popular beach on the island and the perfect place to enjoy a long scenic walk or seashell gathering, as you’ll find plenty of them on the shore. This beach is open from 8 a.m. to sundown every day and parking costs are $8.00 per day. 12-month beach parking passes can also be purchased for $50 which can be a good deal if you plan on visiting the area multiple times. You can wade across the shallow tidal lagoon at Tigertail Beach to get to the open water beach on Sand Dollar Island, a barrier island in the making. Tigertail Beach is also known for being a birding paradise with dozens of different species that use the area as a nesting site, and it is a part of the South Florida Birding Trail. Be sure to bring your camera to get some amazing photos of exotic bird species, and grab some of the beautiful and colorful shells that dot the shoreline. Tigertail Beach is full of amenities, making it a great choice for families, and just a few of them include: a wide range of beach equipment rentals, restrooms, an educational kiosk, a large 210 space parking lot, a playground, picnic area with grills and tables, and the Tigertail Beach Café which serves refreshments, breakfast and lunch meals. The South Marco Beach Access is the second public beach on Marco Island, and it is located on South Collier Boulevard with the parking lot at 930 Swallow Ave. It is also open from 8 a.m. to sundown and offers some facilities like restrooms and a 67-space parking lot, and it also has an $8.00 daily parking fee. 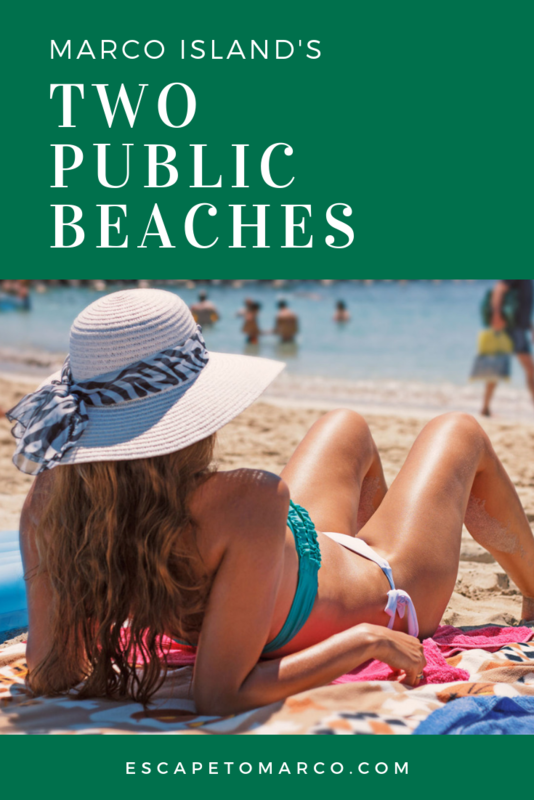 This beach access is less frequented than Tigertail Beach so it’s a good alternative for those who may be looking for something a little more private. Sabal palms surround this beach access, and luxury hotels sit in the backdrop. This beach is another top location for shelling, and you might even catch a glimpse of manatees, dolphins and a wide range of different shorebird species. The county also runs a beach drop off lane near the Marco Marriott at 400 S Collier Blvd as well as an access walk at the Crystal Shores Resort on Collier Boulevard, however these access points lack facilities. Or take a break from the beach and visit some of the island parks with playgrounds and kid-friendly activities. Marco Island beaches are well maintained, routinely raked to keep the sand soft, easy to walk on, and great for families throughout the year with their warm water and top facilities. We can help you find ideal rental accommodations near the most beautiful and scenic beaches on Marco Island, so be sure to visit our most popular 3-bedroom vacation rentals on the island.